Devastatus Rememorari is a tribute to Point Pleasant Park, a popular urban reserve at the tip of Halifax’s peninsula. Hurricane Juan destroyed Point Pleasant Park in 2003. When I moved to Halifax in 2006, I was profoundly moved by my first walk in the park, and my awe at the magnitude of the devastation remained undiminished after many visits. Point Pleasant Park provides stunning evidence of nature’s potential for destruction and its inherent power to heal itself. 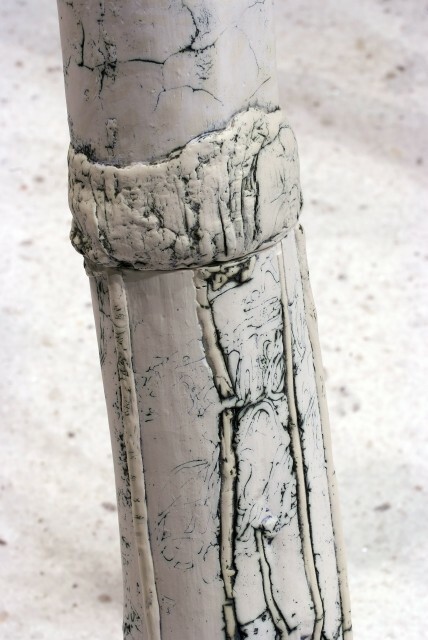 The porcelain forms are pieced together in sections, in a symbolic attempt to help mend and rebuild the ravaged trees. They stand in a bed of salt, which destroys but also preserves. 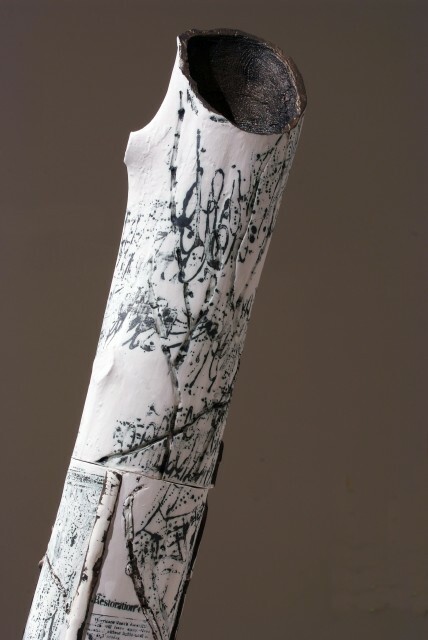 Natural motifs such as branches, leaves, roots, vines, and the tracks of boring beetles are embedded in the walls or applied to the surface of the porcelain trees. 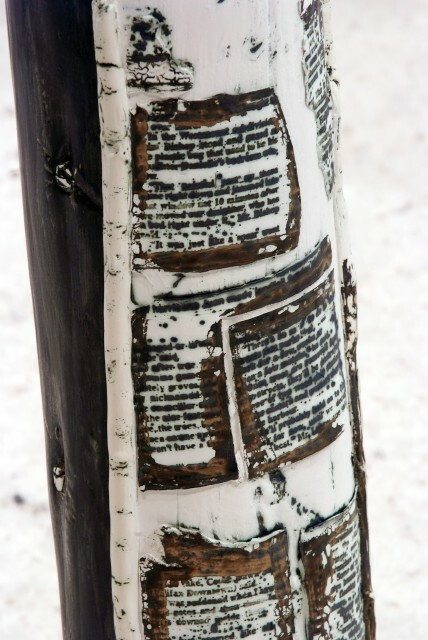 I am also “growing” a new bark made of written text. The words devastated and remembered – or Latin devastatus and rememorari – are repeated in trailed clay slip on the trunks, or transfer printed from my own handwriting. 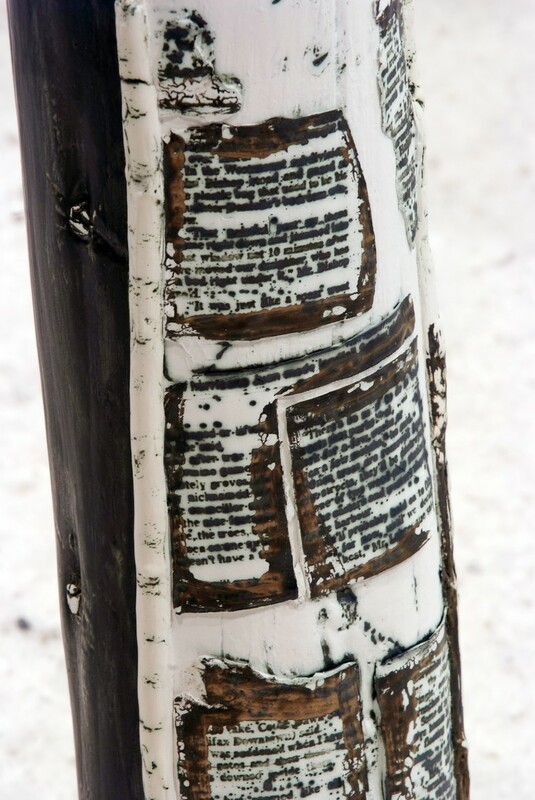 Newspaper clippings reporting natural disasters also appear on the clay’s surface. Devastatus Rememorari was first shown at the Mary E. Black Gallery in Halifax, in 2008. 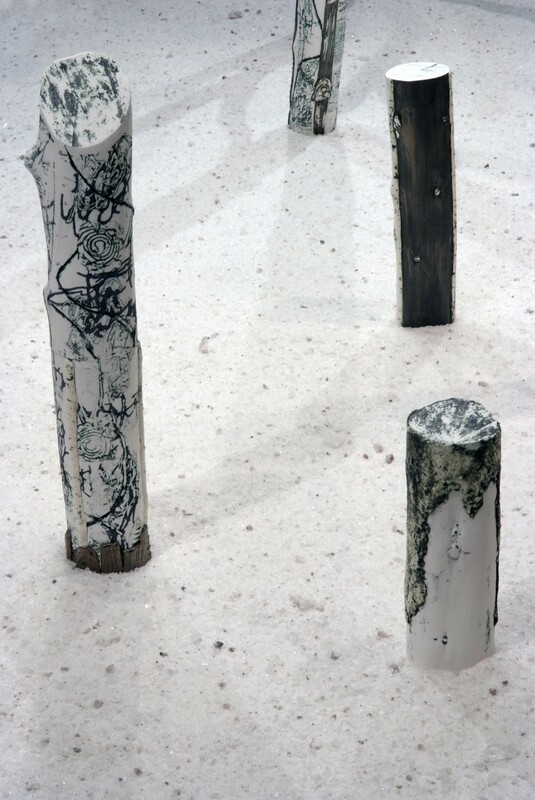 Devastatus Rememorari, porcelain paper clay, oxides, terra sigillata, glaze, metal armatures, road salt, 195 × 338 × 735 cm overall. Collection of the Art Gallery of Nova Scotia. 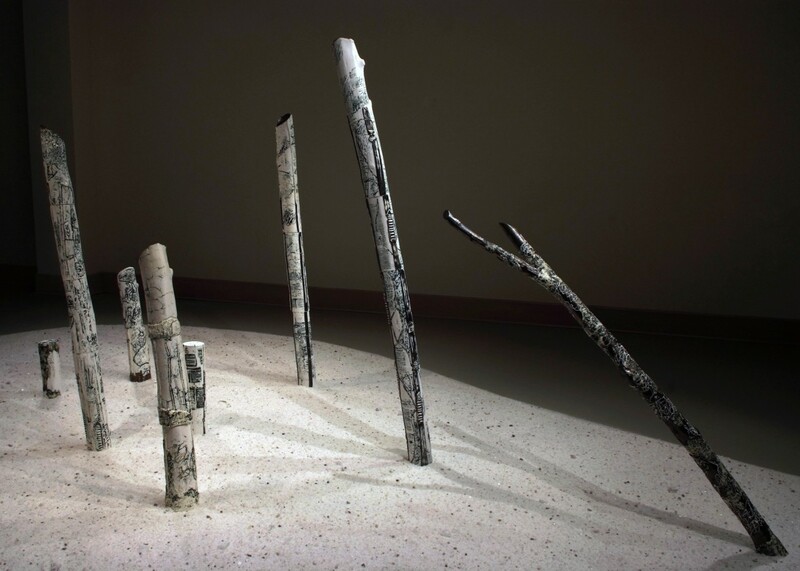 Devastatus Rememorari was subsequently shown at Gallery 1.1.1. at the University of Manitoba (2009), Gallery in the Park in Altona, Manitoba (2009), and Levy Gallery, Moore College of Art and Design in Philadelphia, Pennsylvania (2010). In 2013 Devastatus Rememorari was gifted to the Art Gallery of Nova Scotia and became part of its permanent collection, and in 2015 the piece gained certified cultural property status. 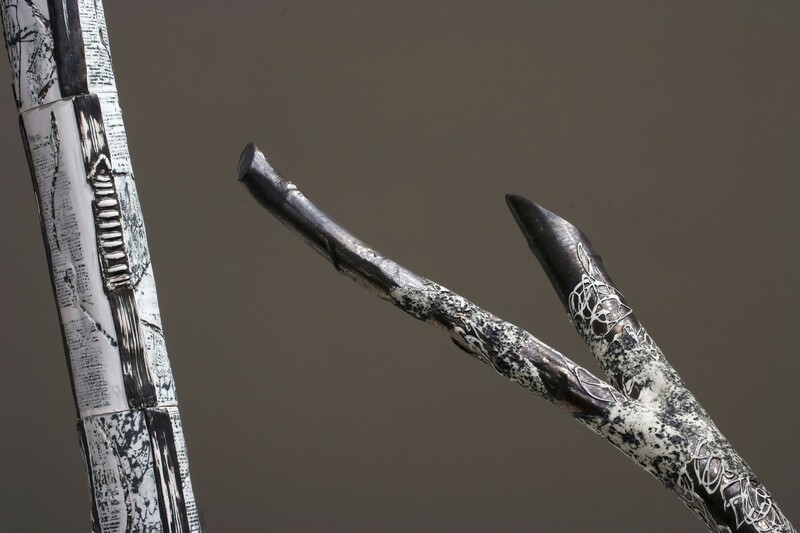 The AGNS exhibited the new acquisition as a solo show from July 18 to December 6, 2015. I continue to investigate devastated trees, damaged through natural forces such as floods, hurricanes, tornadoes, or age, and trees destroyed through human intervention. I collect bits and pieces of trees that have been broken, eroded, cut, and stripped of their bark. In my studio, these fragments become metaphors for the inevitable cycle of deterioration and regeneration. As a record of their former life, my clay forms stand as memorials to loss. But at the same time, by reconstructing them in clay, and by creating a new type of “bark” for the trees, I also acknowledge the natural potential for recovery and our desire to commemorate and restore.